557 pages | 156 B/W Illus. "Krantz is a very prolific writer. He … creates excellent examples and problem sets." Designed for a one- or two-semester undergraduate course, Differential Equations: Theory, Technique and Practice, Second Edition educates a new generation of mathematical scientists and engineers on differential equations. This edition continues to emphasize examples and mathematical modeling as well as promote analytical thinking to help students in future studies. In each chapter, lively historical notes and mathematical nuggets enhance students’ reading experience by offering perspectives on the lives of significant contributors to the discipline. "Anatomy of an Application" sections highlight rich applications from engineering, physics, and applied science. Problems for review and discovery also give students some open-ended material for exploration and further learning. "Retaining many of the strong aspects of the first edition, which received positive feedback from readers, the new edition focuses on clarity of exposition and examples, many of which feature applications of differential equations. … Being an homage to the excellent writing skills of George Simmons and his well-known text on differential equations written back in 1972, this updated edition maintains the highest standards of mathematics exposition. Warmly recommended as a comprehensive and modern textbook on theory, methods, and applications of differential equations!" "Krantz is a very prolific writer. He…creates excellent examples and problem sets." Steven G. Krantz is a professor of mathematics at Washington University in St. Louis. He has written more than 65 books and more than 175 scholarly papers and is the founding editor of the Journal of Geometric Analysis. 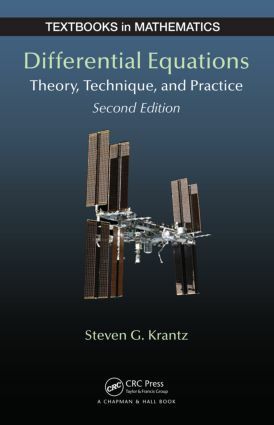 An AMS Fellow, Dr. Krantz has been a recipient of the Chauvenet Prize, Beckenbach Book Award, and Kemper Prize. He received a Ph.D. from Princeton University.